Two ambulances have had to be taken off the road, after bricks were thrown at them while they were travelling to an emergency. 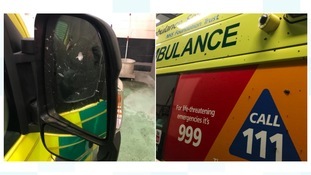 A West Midlands ambulance had to be taken off the road after it was vandalised in Telford. Part of the message read: “I don’t give a s**t if the whole street collapses”. A spokesman for West Midlands Ambulance Service has told ITV News Central that nobody within the house where a bus crashed into in Coventry was injured. Four others - including the bus driver - were injured, but nobody has been sent to hospital. We were called at 6.45am. There were four injuries but nobody is going to hospital. There were initially suggestions the bus driver, 44, was trapped. But he just had a knee injury and was discharged. A passenger on the back seat of the bus in his 20s had a leg injury and was discharged. Two people in a car that collided with the bus were also discharged at the scene. It took almost 45 minutes for firefighters to safely remove the driver from the wreckage of the car. "It's the kind of verbal abuse you have to put up with now and again working at the weekend in the ambulance service." A man has died after a head on collision which left two other people injured. The crash happened this afternoon on the A458 between Cressage and Cound in Shropshire. “On arrival crews found a car and a 4×4 vehicle that had suffered severe damage and was on its roof. Tragically, it was not possible to save the life of the driver of the car, a man, and he was confirmed dead at the scene. – West Midlands Ambulance Service spokesman. A 62 year old woman who was the front seat passenger was taken to Royal Shrewsbury Hospital by ambulance. The 76 year old man, who was the only occupant of the 4×4, suffered head and facial injuries.